The Euro fluctuated between gains and losses during the first half of the day following the volatility of the British Pound ahead of UK's Parliamentary vote on PM May's deal. However, the dollar came under selling pressure after US CPI data rose 0.1% than the 0.2% expected. Looking ahead, the EU will release its January PPI, while the US will also release producer prices and January's Durable Goods Orders. 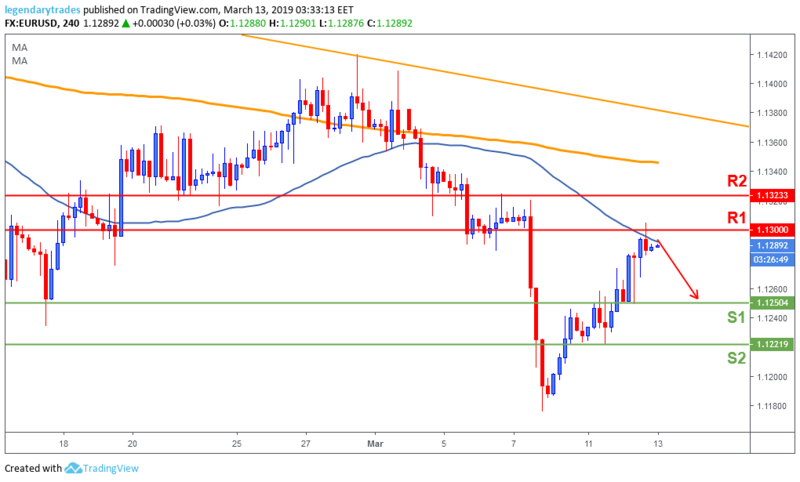 The Euro had a third consecutive bullish session yesterday but failed to break above 1.30 (R1) with the 50-day moving average forming a bearish slope. Price will likely head back towards 1.1250 (S2) as long as 1.3 (R1) holds as a resistance. A break above it, will take the price higher towards 1.1325 (R2).